The Bulgari Resort in Bali is a dream location for a destination wedding. The lush jungle gardens, the epic views of the ocean, the privacy of the rooms, and the impeccable 5-star service make it a favorite for couples seeking a luxury experience at their Indonesia wedding. 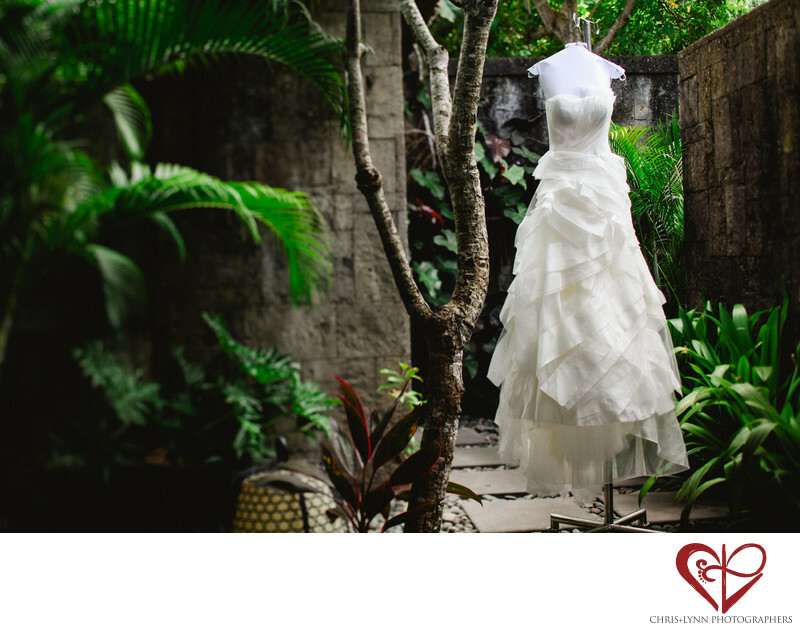 For this wedding dress photo of the bride's couture Vera Wang gown, Chris used a tilt shift lens to emphasize the dreaminess of the location. The delicate layers of white tulle make an interesting contrast with both the green ferns and solid black walls so distinctive to this venue. Two days later, this dress was being rinsed out in the bathtub after sand and moss collected in the skirt! The adventurous bride wanted photos that showed off the diversity of their Bali wedding location. She and her groom had a portrait session along the beach and in the monkey sanctuary of the damp moss-covered jungle at Ubud! As we always say, a little dirt on your dress means you had fun on your wedding day! We're happy to report that with one dry cleaning back at home the couture gown was back to its pristine condition. Location: Bulgari Resort Bali, Jalan Goa Lempeh, Banjar Dinas Kangin, Uluwatu, Pecatu, Kuta Sel., Kabupaten Badung, Bali 80361, Indonesia .